My son thought it would be a great idea to keep a few butterflies to see if they would mate and lay eggs, so we could start the whole process all over again. We don't have a large butterfly cage so we decided to create our own. The bottom is our glass aquarium, and then we've inverted a large plastic bin on top of the aquarium to give them more air space for flying. The plastic bin isn't the exact size of the aquarium so there's room for air to circulate in and out. While this works for butterflies, it would not work for caterpillars! Of course, the next question is how to do you tell male butterflies from female butterflies. The only information we found said that females had larger abdomens. So we started looking at their abdomens and there did seem to be a variation in size. We might have males and females. Compare the two abdomens. 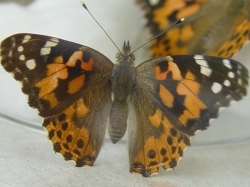 The abdomen of the butterfly on the left seems to completely fill the space between the wings. But the butterfly on the right seems to have lots of space between the wings and the abdomen. Both butterflies were sitting with the wings open when we took these pictures. 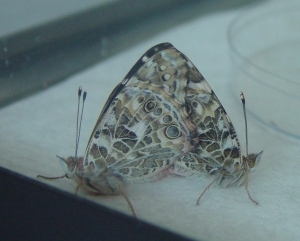 To us, it looks like the butterfly on the left is female and the butterfly on the right is male. The next step was to think about their habitat and what should be there for the next stage in the lifecycle. 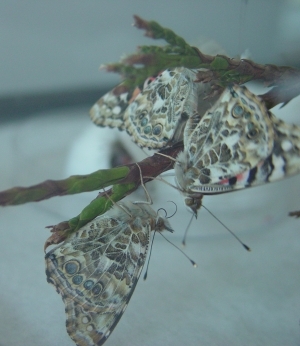 Painted Lady Butterflies like to lay eggs on the plants that the caterpillars would like to eat. We found some thistle and borage plants that could be moved into a small plastic container with dirt. These plants will be easy to move into a better caterpillar container if the butterflies lay eggs. They seemed to be doing well for the first couple of day, but there was no sign of mating behavior. That changed last night. Throughout the afternoon there seemed to be a lot of fluttering going on. Then they all paired off and stayed together throughout the night. Here are three butterflies on branch. Two of them are facing each other. At first we thought this was preliminary mating behavior. But look carefully along the stick. You can see the abdomen of the butterfly in the middle reaching across to the abdomen of the butterfly that is on the other side of the stick! Now we'll just have to wait and see if they were successful! 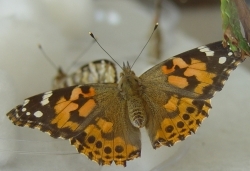 Read more about raising Painted Lady Butterflies. This page contains a single entry from the blog posted on May 17, 2008 11:19 AM. The previous post in this blog was Feeding Butterflies. The next post in this blog is Butterfly Eggs.